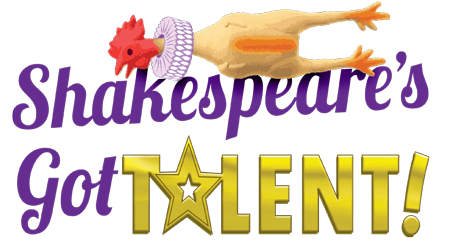 Have fun with some of Shakespeare’s most famous characters in this comical TV talent show parody! Our host, Puck, the mischievous fairy from A Midsummer Night’s Dream, is joined by the Fool, a classic Shakespearean side character, who adds wit and fun with his not-so-foolish interjections. Romeo, King Duncan, and Portia create an eclectic panel of judges for a collage of skits featuring other characters from the Bard’s greatest hits, including Hamlet, King Lear’s three daughters, Desdemona, the witches, and more! Of course, the talent portion of the TV show soon takes side stage to hilarious high drama behind the scenes, especially with Macbeth as the stage manager and Macduff as sound engineer. Read more...There’s all the trademark Shakespeare tragedy — plots against kings, pining for love, witch’s predictions of forlorn fates — but with comedic twists including pillow fights, rubber chicken duels, and a disco dance finale where the judges decide to award themselves the winners. With minimal sets and props, Shakespeare’s Got Talent! introduces students to another side of many of Shakespeare’s most famous characters and plays in a manner that’s quite silly, highly entertaining, and easily relatable.